Twenty people were injured in the blast and ten of them are in critical condition. Forty passengers were on the bus. 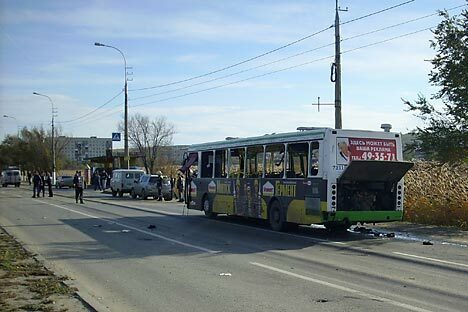 An unknown explosive device was detonated in a bus in Volgograd, central Russia, killing at least five people and injuring 20. A terrorist attack is now viewed as the cause of the blast. The National Anti-terrorist Committee confirmed that it was a terrorist attack. “Control headquarters is coordinating fast response services, as well as security forces, to prevent more explosions from happening,” a National Anti-terrorist Committee representative told Itar-Tass. Russia’s Emergency Ministry is ready to send a plane to Volgograd to evacuate the injured to Moscow, according to the official representative of the Emergency Ministry, Irina Rossius. “The Il-76 plane, which is equipped with a medical module, is ready to leave for Volgograd if it necessary. A decision will be taken due to medical conditions,” the spokeswoman said. The condition of 10 people, who have been injured in the explosion, is considered severe, according to Rossius. “Eight people are now at the intensive care unit,” she said, adding that doctors inspected another seven injured persons on the spot. A murder case has been opened. “According to preliminary data, an unknown explosive device went off inside the bus, that’s why a terrorist act may be viewed as one of the possible causes of the blast,” a source in the Investigative Committee told Interfax news agency. Volgograd is situated 1,000km to the south-east of Moscow. No militant or terrorist group has so far claimed responsibility for the attack. Authorities says it’s too early to speculate on the attackers.